With the exception of the larger screen at the rear, which results in slightly smaller buttons alongside, nothing new stands out on the X-E2 until you cast a closer eye over the body. 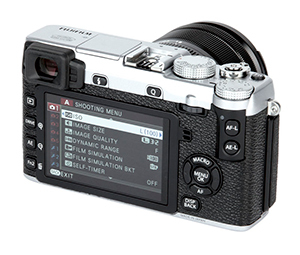 The Q menu button has been relocated to above the screen, freeing space beneath the exposure-compensation dial for independent autofocus lock (AF-L) and exposure lock (AE-L) buttons. 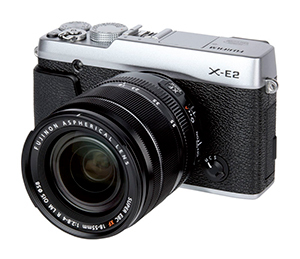 The responsiveness of the EVF’s eye sensor is identical to the X-E1, as is the drive button beneath, which gives instant access to ISO bracketing, continuous shooting, HD video, motion panorama and new advanced filters. For other common settings, such as aspect ratio and noise reduction, the Q menu is used in conjunction with the rear scroll dial. The magnesium die-cast top and front cover contribute to a robust feel. Although the rubber grip at the front looks like an afterthought, with its raised profile it considerably improves handling. Despite being a touch nose-heavy with the kit lens attached, the body feels comfortable in the hand over long periods, although it requires support with your left hand for added stability. On the top-plate, the on/off button wraps itself around the shutter button, where there’s a thread for attaching a traditional screw cable release. The shutter-speed dial, like the exposure-compensation dial, is beautifully machined from metal, and there’s a greater separation between the ‘A’ setting for auto control and the maximum permitted shutter speed of 1/4000sec, helping to make it feel like you’ve entered a new setting. Another prerequisite is the option to assign a custom function to either of the two function buttons, or the AF/AE buttons.